Due to inflation expectations and the risks, once retired I would keep my money in the inflation protected vehicles - precious metals, government bonds. 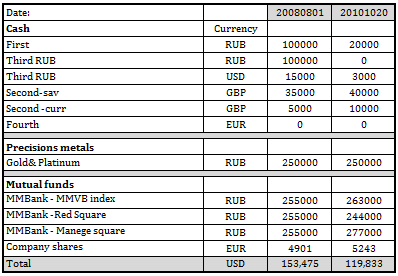 Why to invest in various currencies? World major Currencies. There is several major currencies in the world - US dollar, Euro, Pound Sterling, Japanese yen and Swiss Frank. The latter is just a combination of the four currencies (Official Swiss Franc 2011 composition is 60.2% USD, 26.7% Euro, 4.2% Pound Sterling, 3.9% Japanese yen). So there is no real point to buy Swiss Franks - they are known to change the currency composition quite dramatically. Japanese yen - on December 29, 1989, Tokyo's Nikkei stock average reached its all-time peak of 38,915.87. Twenty years later, the Nikkei has never again reached that level — and, in 2009, reached a new low of 7,054.98. Renminbi (CNY ), although through most of its history, the value of the renminbi was pegged to the U.S. dollar. Recently CNY has been strengthened to US Dollar - year to year from 6.6 to 6.3 - about 5% difference. Inflation. There is so many articles written about inflation, explaining benefits and downsides of it. What does it mean for an investor? Part of the budgeting is not only see how are you doing now and where the money goes to, but to have vision how to get from A to B. This means, that should I keep my contributions at $40 K a year, I will reach my target of financial Independence ($60 K a year from my investments at 3% interest) between 2033 and 2042, depending on the stock market performance. My emergency fund and precious metals are not contributing towards growth - I use interest rate for the savings account at the inflation rate. It does not exactly right, but it simplifies. We have to follow the jobs, so after four years, we moved. It took some time and money. Luckily new employer is going to compensate all expenses up to $ 12, 000 but still there is a lot we had to pick up ourselves. New car, eating out every day for first month, while searching for accommodation and living in a hotel. We will be residing in one of the most expensive areas in the country. - Do research for new property in advance, contact real estate agents. - If you know what car you want - put down payment, so the car will be ready for your arrival. - Collect references from your current landlord, if you are going to rent. - If you need school / child care - apply as much in advance as possible. In short it is all about preparation and investing your time in planning and getting to know. Be ready, open minded and enjoy time with the family. Family budget 2011 – US $71,5 k – above target of US $65 k.
Results for year 2011 are a bit early, but for one simple reason – we are on a move, hence there is a lot of expenses associated with it (luckily most of them picked by new employer). If we would continue to live like for the rest of 2011 we would end-up spending US $ 71,5 k this year, which is way above targeted US $ 65 k.
Durable goods - 10 year period. I have been heavily involved in closing out a contract at work last month, hence 13-14 hours a day, for a month was a norm. In our industry competition is fierce, hence no overtime, no bonuses, just hard work. Thinking about family finances made me realize that every new appliance means that sooner or later it will require a replacement and you have to start saving for it straight away. It means that to replace them we have to save about 600 USD a month, just to maintain current position. This is just a reminder that every new buy will cost you over the lifetime, just to keep it the same. My goal for this year is to accumulate in savings - $ 40 K and invest them. So far I am on target - $ 14 K.
As you could see the only difference is in highly liquid assets - money. Investments in mutual funds, stocks and precious metals so far is a zero sum game - after three years. At the end of the year there would be a question - where to invest? I am keep reading and making notes of the books I read so far, and plan to publish my opinion and feedback on them. While I am still going to prepare what and how we did in the above mentioned period, just to track expenditure and spending habits. I am going to shift the focus from what we are doing towards my goal to financial independence. 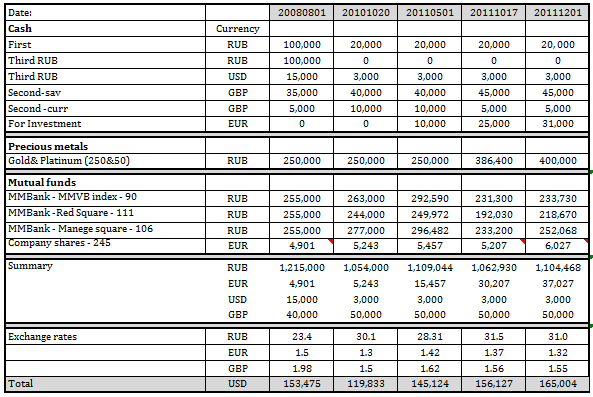 However, I started accumulating the content and did some basic analysis back in 2008. Last year I invested all available resources into couple of properties in the apartment blocks that are currently being built. 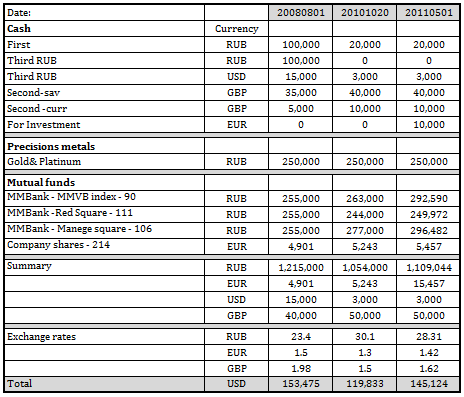 Despite the fact that we paid 100% upfront in Russia it is a high risk investment, as there is not any guarantees or protection. The reason for such step is not gaining any advantage, or additional rental income but to have some security against uncertainty. 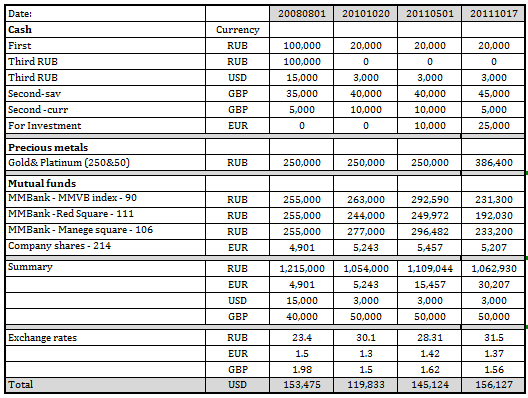 Typically it takes 5-7 years in Russia from time money are invested, till you have keys. As an example - the apartment I bought is being erected with original deadline in 2007. I invested my money in 2010 with verbal promises that it will be finished at the end of 2010 and all utilities connected and paperwork completed in 2011. In contract itself there is no any guarantees whatsoever. This is reality in Russia, the building company is among several behemoths with connections to the very top. Then again the apartments are bought as non-investment, for living. In other words it was not procrastination of any kind, just diverting of my money elsewhere. 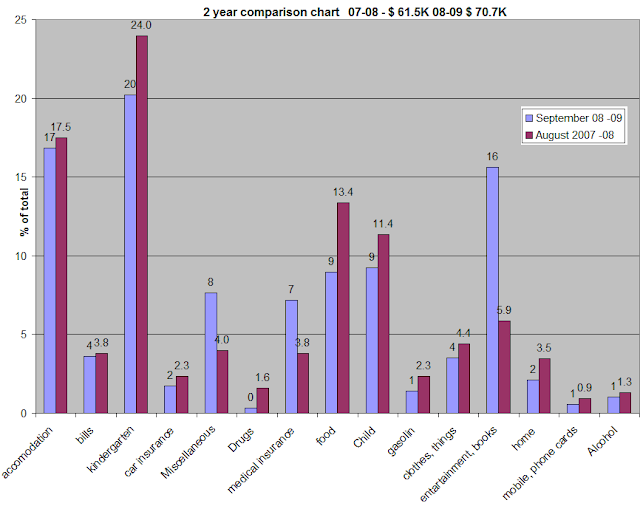 Family budget comparison over three years 2007 through end 2010. Child is growing and kindergarten fee is supposed to be lower, but they keep increasing fee annually, so really there is not much of a difference. I joined a different project in my company and now medical insurance is provided covering the whole family free of charge, so we managed to save some money there. Note: Year 2007-2008 is a bit out of balance with the rest as we did not go on vacation that year. Kindergarten - we both work, so the child has to go to a kindergarten. Its actually enjoys it quite a lot, to socialize with friends and be among kids of the same age. Car insurance – speak to itself and everything related to car maintenance. Medical insurance - speak to itself. It is provided be the employer, so we only have to pay co-pay, dental is not included. 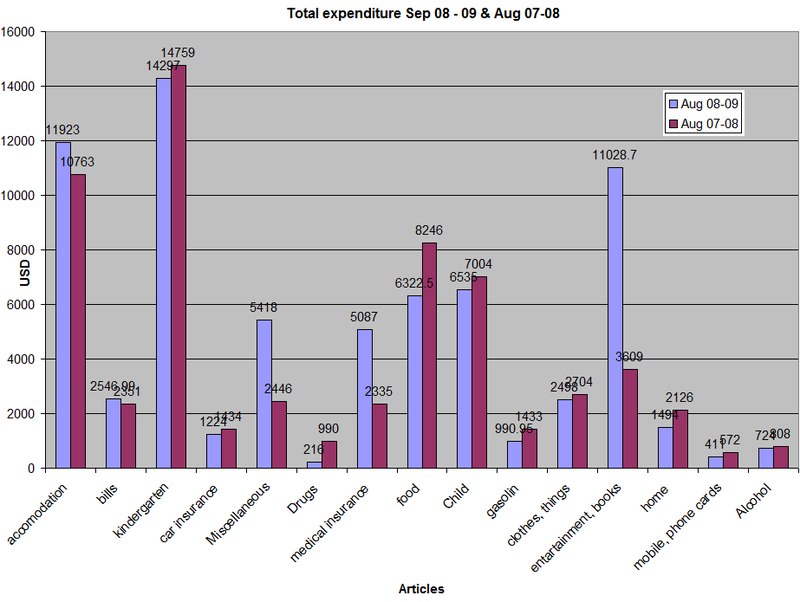 Gas – idea was to look how much to we spend on gasoline and how it weight in overall budget. I know that gas price affects other items as well, but we just thought it would be nice to count it separately. Joy – occasional days away and vacations, it is also include all other expenditures – cinema, restaurants, parks, etc..
Comms - mobiles, phone cards. Alcohol – it is good to count, what we are spending on it. Apart from special occasions we tend to limit ourselves to $20 per bottle of wine max.